Labeling is one of the integral parts of the packaging of the product. Labels cover important information that helps the customer to communicate with the company. There are various other advantages of labeling like it is easier to identify the product, helps in promotion of the product and also provides with the necessary information required. There are different kinds of labels such as paper, PP, PE, inline coating or varnish, emboss effect etc. PP labels i.e. Polypropylene labels are used when you need clear looking labels. This label rolls are stronger, more rigid and also offers more temperature resistance. These PP labels are used as both industrial as well as commercial labels. PE label is polyethylene label that involves multiple extrusions and can be easily recyclable that offers good resistance to water, chemical and is also UV resistant. There are different applications of PE labels that include outdoor labels, electronic labels, labels for detergents & soap, glass bottles etc. Every step of the label making process through the inline coating is under your control, the design that gives more flexibility and control. Labels with embossed effect allow adding pattern effects or decoration, lettering, custom design etc. The embossed labels are been used in different areas like wine bottles, food packaging, cosmetic and personal care products and many more. Along with this, labeling in the industry helps for information transmission of the product i.e. all the important information about the product as of how to use, recycle, transport, storing conditions and the validity of the product. Manufacturers can also display with their contact information so as the consumer can contact for any queries. 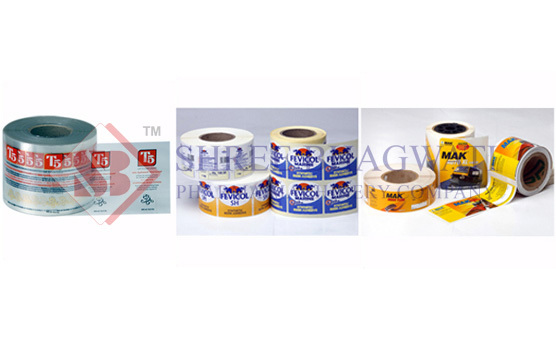 Bhagwati Labeling offers different types of labelers under one roof. We offer labeling with high-quality label rolls that match the exact need of the industry. Along with this, we also print self-adhesive sticker labels in roll form, duplex cartoons and printed shrink films. With this self-adhesive label rolls, we labeling with our different types of labeling machines for variety of containers like round bottle, oval bottle of different shapes and size. Our other products include different types of labeling machines like bottle sticker labeling machine, vial sticker labeling machine, shrink sleeve applicator and induction cap sealing machine. For more information contact us today and know about the different label that fits for your product.